The question of whether government-issued money is a debt has shown up in two recent contexts. The first is an fundamental argument about money, and how to think about it. The second is a more technical question: if the central bank replaces government bonds with reserves (which are a form of money), has the debt-to-GDP ratio gone down? To summarise my views: yes, (modern) money should be defined as a form of debt. But since the central government with a free-floating currency cannot be forced to default, one can question whether it makes sense to treat central government debt like the debt of other issuers. In particular, the debt-to-GDP ratio of such governments is essentially a piece of trivia that can be safely ignored. There has been an online debate between Randall Wray and Eric Lonergan regarding money. I broadly agree with Randall Wray's position, although Lonergan rightfully objected to some statements that I believe were not carefully worded. This debate then spilled over elsewhere. One of Lonergan's articles ("Debt-free money: A brief reply to Randall Wray"), which I will refer to here. The link and online debate at Mike Norman Economics. Debts have a different function and source of value to physical cash. Debts are used to provided [sic] streams of cashflows to their holders, and their value resides in the debtors ability to meet payments. By contrast, money is used to pay for things [emphasis mine - BR], and its value resides in a network externality – it has value to me because it is accepted by others. Very simply, Lonergan has made his own definitions of "money" and "debt," and argues that "money" is not "debt" by his definition. As a mathematician, I have been trained to accept that people can define terms as they wish; the only constraint is that they are using them in a coherent fashion. That is, so long as Lonergan uses his terms consistently, I cannot say that he is "wrong," and in fact, there are some reasons to have sympathy with his views. Unfortunately, his definition is somewhat loose. If we define money as "money is used to pay for things," there are a lot of instruments that are "money" by that definition that are also undoubtedly forms of debt. Accounts receivable are routinely used to transact business amongst firms. I routinely pay for goods and services in stores using a credit or debit card. In both cases, there is a change in a deposit or payable account. I can pay for security purchases in my retirement account by selling a Treasury bill. Institutional investors routinely finance securities positions with repurchase ("repo") transactions. This shiftiness in the definition of "money" famously sank Monetarism; anyone inventing new definitions of money should take heed of lessons from an analytical fiasco that only happened about thirty years ago. He has a longer article discussing his definition of money: "Money is not a cigarette," which I found did not add too much to the definition above. Additionally, saying that "Debts are used to provide cashflows" does not eliminate "physical cash" (currency notes) from being considered debt; physical cash can be classified as a perpetual zero-coupon debt in bearer form. In other words, just a special case within the spectrum of debt instruments. The holder of a ten dollar bill has the right to demand conversion of that ten dollar bill into $10 of settlement balances at the central bank ("reserves" in American parlance); the central government has the corresponding obligation to make that conversion. In other words, currency ("physical cash") is just a settlement balance ("reserves") at the central bank in bearer form. So the correct question to ask is: are these settlement balances "debt"? You argue that a dollar is a claim on reserves, and reserves are a deposit at a central bank and a deposit at a bank is a liability. That just begs the question. I.e. the big question is whether a so called liability of a central bank is the same as a liability (i.e. a deposit at) a commercial bank. Certainly reserves APPEAR on the liability side of a central bank, but that's just to keep the double entry book keeping in order. There is actually a HUGE difference between deposits at central and commercial banks. A central bank is part of the government machine. And the government machine has no obligation whatever to give anyone anything in respect of their holding of reserves. In fact the government machine can simply raise taxes and say to people "Give me some of your reserves else you go to prison. Now [insert mild English term that is disapproved of in North America] off". In contrast, there's no way a COMMERCIAL BANK can do anything like that. Yes, I am essentially begging the question. We are caught between two principles that appear contradictory, yet I agree with both. "We cannot analyse a central government (with a free floating currency) like any other entity, such as a household." All entities within an economy have a well-defined balance sheet, with Assets, Liabilities, and Equity. By any reasonable definition, a deposit at any bank (including the central bank) is a liability of that bank. If we follow statement #2, balances at the central bank are technically defined as liabilities, that is to say, debt. From this standpoint, the debate is over. But what about statement #1? Should we not treat the central government differently, and thus we can define its debt differently? This is actually a fairly reasonable stance, but it raises problems, as I discuss at the end of this article. The problem with statement #1 is that it is a more of a sound bite than a statement of fact. A more accurate version would be something like "we cannot treat the default risk of a (modern) central government as being like the default risk of a household." An extremely brief summary of the analysis within my eReport Understanding Government Finance is that a central government (with a free-floating currency) cannot be forced to default, rather any possible default is the result of a voluntary decision by the government. Sure, there are qualifications and details that are hidden from that summary; please see the eReport for further details. What matters for our present purposes is that this raises questions about government debt. The reason why debt is seen in a negative light is because of default risk; if the government "cannot default", why worry about it? As a result, I cannot object too strenuously against the idea that central governmental liabilities are quite different from private sector debt. And those liabilities include both bills and bonds, as well as "money" (currency notes and coins, central bank settlement balances). What About The Debt-To-GDP Ratio? The debate so far has been entirely semantic, and therefore does not really have a "right" or "wrong" answer. However, there appear to be implications for the discussion of government debt, where there are presumably operational differences between the two views. An article by Tom Elliott reports on the analysis of economist Masazumi Wakatabe of Waseda University (H/T @JoScoMac), in which he nets starts out with the net debt figures of the IMF (pictured above), and corrects for Bank of Japan bond holdings. With this change, the net debt for 2014 drops to 41% of GDP (versus the 126% of GDP given in the IMF World Economic Outlook). It follows that QE has almost certainly caused a significant reduction in the net debt of government and, while it continues, there is no plausible fiscal constraint. However, QE makes no operational difference. 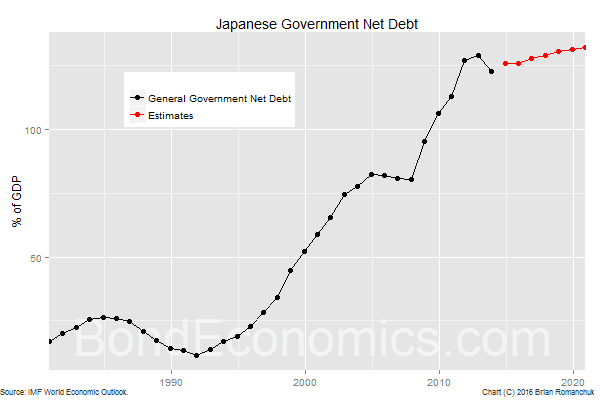 Since there was no chance of an involuntary default by Japan anyway, it does not matter whether the net-debt-to-GDP ratio is 41% or 126% of GDP. There is no plausible fiscal constraint, with or without QE. The only reason to care about government debt levels is if we want to see how they affect the rest of the economy. We can run simulations of how debt interest payments will affect income flows, based on various scenarios. The greater the debt, the greater the interest payment, if interest rates are positive. In the countries with QE, the policy rate is near zero (or negative!). If the interest rate is zero, it does not matter whether the government liability is a settlement balance or a Treasury bill. Therefore, switching definition makes no difference. In other words, the interest cost for the government is almost exactly the same, regardless of QE. There is a small technical difference, in that the central bank is now paying interest, but that just reduces the dividends that the central bank would have paid the Treasury. There is no difference between the use of QE and its absence from the perspective of the private sector. Whether or not you consider "money" to be "debt" is pretty much a personal choice, akin to choosing your favourite genre of music. However, even if you decide that the monetary base is not "government debt," that choice has exactly zero operational impact on the analysis of government finance -- and QE still accomplishes almost nothing. The case of token money in the Canadian colonies. And photographic evidence of what Neil Wilson refers to in the comments section (in the other article). I agree with everything you write here. But, I think we should think more about what's at stake in this debate -- why do they care? It seems to me that on Lonergan's side the concern is with the way in which credit money gives the banking system the ability to determine the overall level of activity and to make an unjustified profit from its operation of the payment system, which should be a public good. Whereas for Wray and MMT folks, it is taken for granted that there is always a tight link between the quantity of government-supplied money and the level of activity (tho the mechanisms for this vary) so the problem that debt-free money is supposed to solve simply doesn't arise. A striking thing about MMT in general is how uninterested it is the banking system -- there is simply a straight line from "money" or "net financial assets" (i.e. total government liabilities) to private expenditure. I think what really divides them is their different views on the autonomy of the private financial system rather the semantic question of money vs debt. To be honest, I did not track down the origins of this debate; what caught my eye was the linkage to QE, which showed up in another article on Japan. I have no problems with the banking system "creating money"; the only catch is that the banks are tightly regulated. They probably should be knocked out of the securities market business (other than the trading of Treasury bills/notes for liquidity management), and we should return to the multi-pillar financial structure we had before the 1980s. (I think Warren Mosler has pretty much said the same thing.) If that were done, I see little reason to care about the "fairness" of the system; the banks pretty much end up looking like private utilities. With regards to the payment system, the guts of the system is a form of public/private partnership. If technology were stable, making it purely public would not be too risky. However, since the systems continuously evolve, dumping some of the risk on the private sector does make sense. However, I can see a justification for the revival of a "postal banking system." People need access to banking services, and private banks do not have a huge incentive to provide those services to the poorest. How this would work depends upon where you are; in Canada, with only a few major banks, it is not that hard to arm-twist them to provide such services, and so a postal bank does not need to be set up. I think Randall Wray has written about that topic. "in which credit money gives the banking system the ability to determine the overall level of activity and to make an unjustified profit from its operation of the payment system, which should be a public good." There is quite a bit about banking in MMT. Mosler talks about it all the time since that's his game. But primarily the MMT line on banking is that the liability side is the wrong place to control the banks and that it should be regulated on the asset side. In other words what banks can lend for should be proscribed and everything else become illegal and unenforceable. Beyond that the central bank should just run overdrafts to cover the liabilities that banks require. So no interbank market. The big one though is de-collateralisation. Banks should not be able to lend against collateral. The job of a bank is to lend new money, not operate as a Pawn Shop. Therefore they should really be discounting future profit flows. Whether the banks make a profit out of the payment system is the same argument about whether any outsourced operator makes a profit out of running an outsourced operation. That's just an argument against outsourcing of public services. There is nothing particularly special about banks in that sense. Banks make a profit on the flow of money because there is a job to be done deciding which projects get funded and which don't. The argument at present is that is best done in a distributed fashion by banks. You can argue for other ways, but at least do it honestly - by presenting the centralisation case in that manner. Dollars are not a debt, they are a credit against tax debts. Government honors those credits against taxes, it doesn't have to provide anything in return. Taxes help enforce the value of the dollar, even though the actual value is provided by people and businesses offering services. Tax enforces dollar value, private services provide dollar value, public services support dollar value. If we dig deeper, there are actually two forms of the dollar. The fed issues dollars but the treasury issues its own form of dollars as bonds. I would consider treasury dollars to be a form of debt for the treasury department, as they commit to redeem bonds for federal reserve dollars. But treasury bonds are not "U.S. Government" debt, because both fed and treasury operate under the authority of congress. The fed can purchase treasury bonds at any time for its reserves(balance sheet). Congress could even direct them to do so. Separation of the fed and treasury is a good idea, as the power to issue currency assets should be done with a cool head and technically savvy. Central bankers (should be) in a position to do this effectively. Treasury dollars are not a currency asset, they are a savings asset. So there's less immediate technical challenge in managing the supply of treasury bonds against inflation risks. By issuing a savings asset, the treasury is similar to a bank in some respects. Banks always have "debt". Instead we ask "Is a bank solvent? Do their assets cover there liabilities?" "Is the United States Treasury solvent?" You can't put a price tag on the authority to collect taxes. As long as it can sell treasury bonds at a reasonable interest rate, or borrow from the Fed(who weighs inflation risk), it should be fine. With the ongoing authority to collect taxes, it is easy for the treasury to get back into a healthy financial position, provided they have public support. In our current situation, rates are low and the treasury can collect as much savings as it needs to finance its fiscal expenditures. But I question how much treasury spending without QE can improve domestic economic health. Without QE, fed issued dollars are created as debt. If I understand correctly, the fed creates money by issuing loans to banks. I get confused trying to trace the origins of the modern money supply because legacy aspects of currency operations are different from modern practices. Let's pretend there is no QE. Are all circulating fed dollars matched by loans? Does every dollar you hold need to be paid back? Perhaps dollars can permanently enter circulation when someone defaults. I don't know. I think positive money advocates raise important questions, but they go WAY too far with their ideas. Their tone seems to be banking is evil, whereas I feel banking is legitimate, but perhaps creates ineffective behaviors in the aggregate. Are we being too tight with our money? Do we need some slack and give and take in our accounting? I think that's what QE is about. As far as I can tell, QE is the ONLY form of the fed issuing dollars that is not created as a loan. When the CB does QE it purchases financial assets for its balance sheet. Should we think of the balance sheet as the Fed's reserves? Legacy banking frequently involved using commodity reserves, often gold. Why aren't QE balance sheet asset purchases as much an important part of modern banking operations as buying commodity reserves was for legacy banking? I like the questions you raise about the term "debt" and apologize if I have been too casual using that term here. I think the terms "assets" and "liabilities" are more neutral and accurate, as many financial assets are representations of contractual relationships, whereas "debt" connotes either a moral dimension, or power imbalance where the creditor has power to enforce the debt. I agree that money could be thought of as a "negotiable tax credit"; but that still makes it some form of a liability of the government. It is used to cancel out an asset - taxed receivable. I do like using "liability" (or "financial liability") instead of "debt", but they are essentially the same thing. Since my previous job was to analyse government bond markets, I was not in a position to get worried about the moral overtones behind the terminology. Thanks! That helps me out a lot and I know where to look to learn more now.
" ....the central government with a free-floating currency cannot be forced to default......... the debt-to-GDP ratio of such governments is essentially a piece of trivia that can be safely ignored. " Immediately following from this is that the debt-to-gdp ratio of the individuals and firms under such a government can be similarly considered irrelevant trivia , since unlimited quantities of defaults can simply be absorbed by the government , and then ignored. This is really a sweet deal , but I suggest we keep it to ourselves , just the same. That way we're less likely to suffer from gov't administrative delays when we submit our huge debt loads for erasure. Sure, if there was a compelling national interest for the government to absorb private debts. In fact, that is pretty much what government's did for banks after the Financial Crisis. However, such bailouts seem to be politically unpopular. As a result, we still have to do our credit analysis of private borrowers (unless you think they are "too big to fail"). “…even if you decide that the monetary base is not "government debt," that choice has exactly zero operational impact on the analysis of government finance..”. Strikes me there is SOME SORT of impact in that a debt is widely taken to be something that must ultimately be repaid. In contrast, base money so called debt just isn't repaid - ever. That is, the stock of base money just grows and grows in terms of dollars. The impact would be particularly serious if those numpty politicians got the idea that base money was a debt that had to be repaid: they’d start campaigning for a budget surplus in order to pay down the debt and all that nonsense. "Strikes me there is SOME SORT of impact in that a debt is widely taken to be something that must ultimately be repaid"
In the big world of debt, debt is rarely repaid. It is rolled over. Essentially you just have dates where the interest rate might change. Only little people repay debt. The U.S. has to pay interest on excess reserves, which are the reserves created by QE. They will compound at the policy interest rate over time, ignoring effects that change the stock of liabilities (surplus/deficit). The same is true for Treasury bills - they are continuously rolled over (as Neil above points out), and compound at the short-term risk free rate as well. If you have a fancier model that takes into account the interest on bonds separately from Treasury bills, then there would be differences; you are replacing a fixed term debt with a rolling debt. But such models are pretty much unworkable; people have a hard time forecasting where bond yields will be one year ahead (for proof, look at everyone's annual forecasts released in December), never mind 10 years. Andrew Jackson repaid nearly all of the debt of the U. S. That was pretty disastrous for the economy, eh? You even have economists who think that debt must ultimately be repaid, that therefore government debt (US, Japanese, Australian, etc.) is a burden on future generations who have to repay it, and that rational people will save money in order to repay the debt on the eventual day of reckoning. "Very simply, Lonergan has made his own definitions of "money" and "debt," and argues that "money" is not "debt" by his definition." Well Brian, we can have money-be-debt and money-not-be-debt at the same time! Use the analogy of ice and water. Certainly ice is water (only it is frozen) but certainly ice is NOT water because ice is hard (stiff like a rock). When comparing debt and money, we are making a similar two criteria comparison. If we agree that a bank loan can increase the money supply, then money must trace back to a identifiable loan. That dollar in your pocket must be a small fraction of a single bank generated loan made in the past. That dollar will disappear if it is used to pay down a (any) bank loan. You can see that I would support Lonergan's first quote (as printed here). You can also see that I would agree with Lonergan's second quote (which you disagreed with). I would argue that Lonergan is focusing on the differences between ice and water, not the more basic observation that ice IS water. 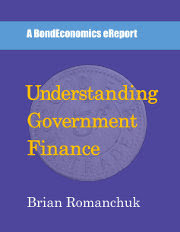 Moving on to your point "Yes, Government Finance Is Not Like Household Finances. ", the two "principles" you identify are NOT mutually exclusive. There is no conflict between them. The important difference between government and other entities is that other entities cannot guarantee repayment of debt with money . Other entities can be forced to exchange not-money property to settle debt but that is a far different circumstance from any potential forced settlement of a government debt obligation. This would be in agreement with your position, but here is the problem: There is no link between money and debt in the sense of repayment ability. Repayment ability is simply not part of the distinction between money and debt. But here is an important point: If money is debt in a different form (like ice is water in a different form), then failure to repay government debt results in money that does not disappear. Stated another way, if money is created when government borrows from a bank, the money created will persist until government finally does pay down the debt. I close this comment pointing to the distinction between government borrowing from a bank it owns (a central bank) and borrowing from a private bank. A private bank is filled with funds earned by workers or resource sellers. On the other hand, a central bank has no source of funding unless government gives it tax receipts. This seldom happens. Instead, central banks can loan money to government which is effectively one entity lending to itself. This is a basic creation of money. Brian - the key purpose of definition in economics is to identify the distinct properties of different phenomena. You have to ask yourself, 'Does money = debt, or are they distinct?'. This is both an analytical challenge - to define the distinct properties accurately - and an empirical challenge - to identify distinct phenomena in the economy corresponding to this distinction. If you read the first page of 'Money is not a cigarette', use of the term 'money' consistently, in precisely the way you suggest. Many things do indeed have the property of moneyness/liquidity - it is best thought of as a spectrum. This point is explained in detail in that article. I don't know if this is a legal right/obligation to US citizens (or all holders of dollars) - but no one uses or holds them for this purpose. If in doubt, ask them. It is also not a right, that I am aware of - or care about - for any other currency which I (or anyone else) uses. Now, the holders of debt specifically do so to receive income and repayment of principal. Like Wray, the lengths you need to go to to render dollar bills 'debts' proves the point, which is crystal clear: money is completely different to debt. Ask yourself this: what function does debt serve, and what function does money serve? The more interesting question is why are (some) economists so determined to make two things which are obviously different, apparently equivalent? A portfolio manager can use repos as a source of funding for positions, and those repos (and underlying securities) are undoubtably debt instruments. So those debts are used as "money", and the volume of repo transactions may or may not be comparable to the amount of dollar bills that changes hands. So if I think about "money" as something that allows transactions, I think about it quite differently than the average person on the street. However, if we do start looking at macro models, you end up with the monetary base looking pretty much indistinstinguishable from TBills. John Cochrane did an analysis along those lines, within the DSGE framework. Sure, we have currency ("dollar bills"), which do not pay interest, but that is now a small part of the monetary base, and the central bank has no control over it. In other words, when I look at models of debt dynamics, I do not see a difference which is created by QE. People do hold dollar bills with the expectation that they can cash them in at the bank. The bank then exchanges those bills for reserves. And this ability to cash in is not an afterthought. In the Canadian colonies (pre-Confederation), privately-issued tokens were the main form of currency used (since the Colonial authorities ignored colonist demands for tokens). Initially, there were lots of issuers, and the metal content varied widely. The banks got tired of these dubious tokens, issued their own, and only accepted other tokens on the basis of their metal content only. This lack of acceptance by banks drove all those other tokens out of use very rapidly. (Those other issuers have had the last laugh; those non-bank tokens are now exceedingly rare and valued by collectors...) There was no central bank in those days (the Bank of England was the closest thing), so it is not directly comparable, but it does show that the ability to cash currency in at the bank does matter. I must admit that I am unsure what you and Wray started arguing about; I just jumped on a few points that were related to the other article on QE. I have seen arguments that currency should be considered a form of equity, and not a liability; I am agnostic on that question. But as noted above, I argue that QE essentially accomplishes nothing, and that relies on the fact that interest-paying reserves are equivalent to TBills. If reserves and T-Bills were the same, Greece wouldn't have a problem (it can issue T-Bills). Which precisely illustrates the difference between liabilities & money. Consider my substantive point: Why do you think people buy corporate bonds? And why do they hold dollar bills? Greece - there's an embedded "free floating currency, control of your central bank" assumption in most of my assertions. Greece does not have control of the ECB, and the currency is fixed versus its trade partners. I agree that we can define "money" as something held in order for supporting transactions, and that is how people think of it. However, "money" almost invariably seems to be a form of debt instrument, at least in properly functioning modern economies. (People resort to barter when the previous monetary regime collapses.) It does not have to be that way, but there are forces that push the system in that direction. I plan on discussing one tangential example tomorrow. Although people may offer summary explanations of what they think money is, in practice, there are hidden assumptions about what drives the acceptability of money. As a result, I am not too convinced of the utility of a common sense definition here. There's an explicit fact: Greece can issue debt but not money. Try this idea: Money is evidence of debt . If money is evidence of debt , it remains a physical object that can be used to support transactions. If money is evidence of debt , it is only formed when debt is incurred. If money is evidence of debt , it can be stored in banks. But here is one question: Is money the evidence of debt , generated by banks, individuals or entities lending to themselves? We can answer that question. Make an assumption that individuals and banks can not lend to themselves but allow government the privilege of lending to itself. With this assumption, all money is evidence of government debt. But we still have a money-debt problem. Banks can lend evidence of debt without notifying the owners-of-the-evidence that loans have been made. Each loan of evidence of debt results in a new bank deposit which may be transferred. When we add all the bank deposits, they total more than all the government debt. A big problem. We can solve this over-counting problem. Our assumption that only government can issue money (which is evidence of debt ) comes to our rescue. Bank deposit totals are seen as an incorrect method of measuring the money supply. Bank deposit totals are the sum of bank loans and government issued evidence of debt . This framework has worked for me for a while now. I am still looking for holes in the framework that I cannot explain. Maybe the idea of money as being evidence of debt will work for you. Bank deposits can grow quite independently of the monetary base ("government money") and debt. Inter-bank transactions are typically net settled by transferring government money, but the banking system does not require that much for settlement purposes. It's only in a crisis that people wish that they more "government money." Brian - Thanks for the comment. I'm looking forward to tomorrow's post. The RATIO of bank debt to government debt may become important when the money generated by bank lending approaches the amount generated by government debt. Instability could be created by bank lending (which can increase prices) with the expectation of debt repayment. Government debt can be considered as much more stable, perhaps never to be retired. Both sources of money can increase economic activity if the annual volume of loans increases . "There's an explicit fact: Greece can issue debt but not money." MMT shows there is a simple solution. The Greek government can issue debt, but also the Greek government can tax - both independently of the European Central Bank. Since money is debt, all you need to do is turn this debt into money. And you do that by declaring that you will accept any Greek bond as settlement of Greek government taxes and charges at face value. That immediately puts a floor underneath the Greek debt market and ensures that there is always a demand for the stuff - in both the primary and secondary markets. Essentially you have created a parallel currency usable only in Greece. And of course since taxation destroys money it would eliminate the bond reducing the stock of outstanding bonds. No doubt there are rules against this in the EMU, but then there are other rules and countries have got away with stuff. I think the problem was that this violated various European laws. The Syriza government did not want to start breaking laws, as that might trigger a coup. They had no good policy options. IMO, the main problem with money as debt is not about denotation, but about connotation. "Et dimitte nobis debita nostra sicut et nos dimittimus debitoribus nostris." -- The Lord's Prayer. It is the connotation of debt as sin that gives it a bad reputation. Debt bad, as Tarzan might say. So when the government injects money into the economy and at the same time issues debt in the same amount, that is generally viewed as a bad thing. Whether it is actually good or bad in any particular instance is another question. The "rich people" statement is something I disagree with. Using a four sector model of the United States economy (Treasury, Fed, Aggregate Banks, Aggregate Nonbanks) then monetary gold would appear as an asset on the books of each sector with no matching liabilities. If gold is also serving as the unit of account and means of payment, then monetary gold represents money without any matching debt. However if banks issue deposit liabilities to non-banks, and the non-banks hold deposits as assets to clear payment by transfer of bank liabilities, then bank credit money has properties of both money and debt. When depositors prefer to earn some interest or take risk in equity then banks convert transaction accounts to savings deposits, time deposits, other debt instruments, or paid-in equity at banks. Thus bank credit money and other investments in banks are bank liabilities which are legal evidence of debt. The federal government can run a negative net worth in perpetuity without any adverse consequences for society or for individuals in society. This is because the negative net worth of the federal government is simply the difference between its recorded assets and liabilities, where society will permit the government to issue more liabilities than the value of its recorded assets. Other units in society are not allowed to do this in perpetuity. A federal government with zero net worth is one that holds non-financial and financial assets equal to the level of its issued liabilities. The United States had roughly zero net worth prior to the early 1980s and has recorded a negative and growing net worth since then by reducing progressive taxes and borrowing to cover the deficit. Also, if the US government guarantees a private loan or makes a direct loan, and there is a default loss, then the government either collects taxes to offset the loss, or records a debit (decrease) of its net worth. I am not sure which mechanisms are now reducing the net worth of the government but the point is that government liabilities exceed the book value of government assets. The US government owns vast tracks of land and other unique assets that have large value not recorded on the books, so government net worth in current flow of funds accounting practice is not comparable to net worth of other units. If you consolidate all sectors, yes you will wipe out all debts, and you would only be left with real assets. Monetary gold is a form of collateral for money that is issued against it, and so what we are left with is collateral, and not "money". I will explain this in an article that will be published tomorrow. Brian, As you know the primary distinction between a non-financial asset (actual house) and a financial asset (mortgage instrument) is that the non-financial asset can have economic value stated in dollars without a matching liability due from another party, while the financial asset always has a matching liability. Monetary gold is similar to a non-financial asset since it has no liability attached. This does not make gold an ideal form of money of course due to its fixed supply when society tries to converts some of its risk investments into "money" (risk free instruments) during a financial crisis. The gold reserve system is fated to failure during a panic. Please see my latest article; a gold coin is actually best thought of as a package: an IOU, along with collateral (the physical gold). If a coin is underweight, and it can be shown that the issuer is the source of the defect, it is the issuer's responsibility to make the holder whole. Furthermore, the issuer is expected to redeem the coin at face value. If you "net out" the liability, all you are left with is a pile of metal, which has certain physical characteristics (weight, purity). This weight may or may not bear any resemblance to what is implied by the face value of the coins. As a result, it is no longer "monetary gold", it is "gold gold". 1. Brian says “A ten dollar bill is a perpetual claim on $10 in reserves (balances at the central bank … “. Such a claim can be made by commercial banks but not by others who hold currency. A non-bank private sector entity cannot make such a claim – because it is not permitted to hold an account with the central bank. 2. The status of currency held by banks is different from currency held by the general public. The former may be thought of as currency reserves (and therefore part of the greater entity called banking reserves = bank-held currency plus bank deposits at the central bank), while the latter is unquestionably part of the money supply (i.e. as measured by the monetary aggregate M1). 3. Bank credit money is not simply a form of debt. Bank credit money is created in a variety of ways other than by bank lending. Thus banks create credit money whenever they spend into the real economy (i.e. in order to accommodate their many costs). Bank credit money is also created when the central bank purchases securities from the non-bank private sector, and when the central bank spends into the real economy. 1. Yes, but the banks readily accept the bills because they can exchange them for reserves. Although it's rare, there are people who do have accounts at the Bank of England, and some other central banks. 3) Yes, deposits can be created in many ways, so deposit creation does not imply an increase in non-bank debt. However, the deposit is a liability of the bank. In this article, I am interested here in the instrument - the bank deposit - and not why it has been created. 1. Banks have little incentive to exchange currency reserves for creditary reserves unless they possess more currency than they require (i.e. for servicing the withdrawal needs of their retail depositors). Such a claim is therefore contingent, it is not a perpetual claim. Incidentally, the liability of the central bank to accept currency in payment of tax obligations is also contingent, because not all people possessing currency have tax obligations (e.g. children, and those below the taxable income threshold, etc). 2. Vault cash may be partially correlated with M1, however it is not M1 and is never accounted as being part of M1. And correct me if I am wrong, but is it not true to say that changes in M1 are determined to an overwhelming extent by those changes in retail deposits which are unassociated with currency movements? 3. I should have added to my list of deposit creation mechanisms - "spending by a central government into the real economy". And although I agree that a deposit is a liability of the depository (i.e. to provide currency on demand and to transfer credit money on demand), it is simply fallacious to use the words "liability", "credit" and "debt" as if they are synonymous. They are not. 1. Bank notes wear out (even the new Canadian plastic money), so they will have to continuously return notes for replacements. In some countries, old notes are withdrawn from circulation, and so they have to be returned. Therefore, the expectation is that currency will return to the central bank. 2. What I meant is that vault cash is correlated to currency held by the public. Not sure why I dragged M1 in there. 3. I am a writer, not an academic or accountant. I am probably going to jump between "liabilities" and "debt" solely based on "literary" considerations. (I use "credit" in a slightly different manner.) If necessary, I can be precise, but that usually is in the context of writing about specific instruments that are showing up in financial or economic statements, or time series. However, I am perfectly happy to blur "debt" and "liabilities" (other than contingent liabilities). I have had enough contact with financial engineering to always think about instruments in terms of their economic role, and not how some accountant thinks they should be classified. There are tons of "debt" instruments that have been disguised as practically everything else. Brian said: " .. you could pay at least some government taxes/fees with currency, and so currency can also be thought of as negotiable tax credits, which are another type of government liability. " It is my understanding that U.S. tax forms expressly state that the tax due must NOT be submitted in cash (currency). The Canadian government tells people not to mail cash in, but if you went in person to their offices, you might be able to pay that way. There's a whole MMT shtick about paying US taxes with notes. 1. I see no connection between the replacement of banknotes and the incentive to exchange currency reserves for creditary reserves. 3. I prefer not to blur "debt"and "liabilities". They are conceptually different. 3. I worked as a fixed income analyst. Does ownership an instrument give someone a claim in bankruptcy proceedings? It's hard to see how that such an instrument is not a "debt".